In spearheading conscious and sustainable Occupational Safety, Health and Environmental (OSHE) standards at FPR, on the 22nd of November, 2017 at the Head Office in Harare, staff and management gathered together to raise awareness on occupational safety and health. Running under the slogan “Accident prevention, my number one intention”, staff were educated and entertained by Edzai Isu Trust theatre group. 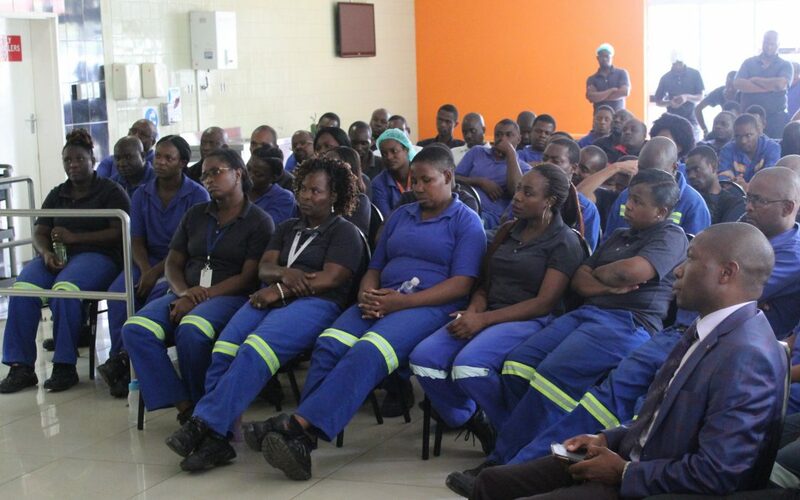 Addressing those gathered, Mr Musengiwa, OSHE Committee Vice Chairperson, noted that the goals of the program are an effort by the committee to spearhead the awareness of safety and health at the workplace. Employers and employees need to set goals around health and safety and then work together as a team to achieve them in order to foster a safe and healthy work environment. The key message from the skit performed by Edzai Isu Trust theatre group was that health and safety in the workplace should be at the front of everyone’s minds. In order to have a safe workplace, everyone within a company must be involved. Employees can be encouraged to review their work areas to ensure no hazards are present. Hazards that they cannot remove or repair should be reported to management. helping new employees, trainees and visitors to the workplace understand the right safety practices and why the practices exist, and communicating any safety concerns to the employer. Mr Fradreck Kunaka, General Manager buttressing on the above also noted that if employees are given protective wear they should use it and if there are not, they should demand for it. This is important because if one fails to preserve their health and safety one becomes a victim at the end of the day. The OSHE committee has organised for another awareness campaign which will be held on the 29th of November, 2017 to ensure employers and employees are better equipped and knowledgeable about ensuring their workplace is safe. This will enable workers to feel more comfortable and confident when they are in that environment. Hence, productivity gets a boost, and profit margins follow suit.